The drama began in July of 2018 when Tim Folger , a freelance science journalist, wrote an article for Scientific American. Folger's article involved the Measurement Problem in quantum mechanics, and its related topics. The article spent most text describing plausible lab experiments that could verify, or even falsify, interpretations of Quantum Mechanics. I will place freelance science journalist in underlined text. The article elicited reactions from readers who sent in letters to SciAm's offices. The bundle of reader feedback included people posturing and claiming to have resolved all of the mystery surrounding the Measurement Problem. Instead of tossing those letters into a drawer and forgetting about them, the editor of SciAm actually re-published two of them in a later edition. A Mr. John Hobson from England attempts to "explain" to Folger that he has it all wrong. That the Measurement Problem doesn't even exist. Then a D. Tuttle from Connecticut repeats the parable of the blind men and the elephant. Concluding : "Our measurements don't show the whole picture". This is a sentiment which is middle-of-the-road prototypical Hidden-Variable Theory. Tim Folger himself then responded to both of these letters in the Letters-to-the-Editor section. This exchange of words did not actually manifest until late October (in the November issue). That response is left out here, because we need to move on to more pressing topics. I will furnish Folger's response letter upon request. Despite anyone's inclinations, one thing is absolutely certain : Tim Folger failed at communicating the problem to these two readers. It is likely he failed in communicating this topic to a bunch of other readers as well. 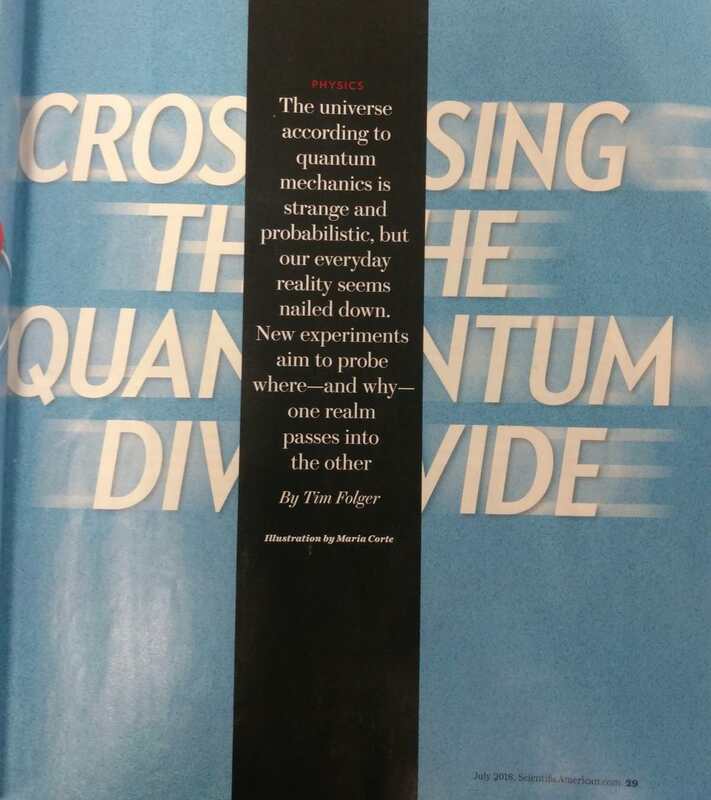 SciAm has an editorial convention of never including any equations in its articles. This is fine, but if I were Folger, I would have included the following explosive anecdote. Despite the fact that we appear to see Wave Function Collapse as human researchers, none of the equations of Quantum Mechanics contain anything like a "collapse" of a wave function. If Folger wanted to lean a little saucier, he could have also mentioned that the formalism of QM does not even contain particle trajectories. (even though we see them in bubble chambers). Going back to the letters to the editor, consider this portion which is written in the simplest and clearest of English. That statement is completely factually true. Somehow or another that sentence didn't stick with Tuttle and Hobson. 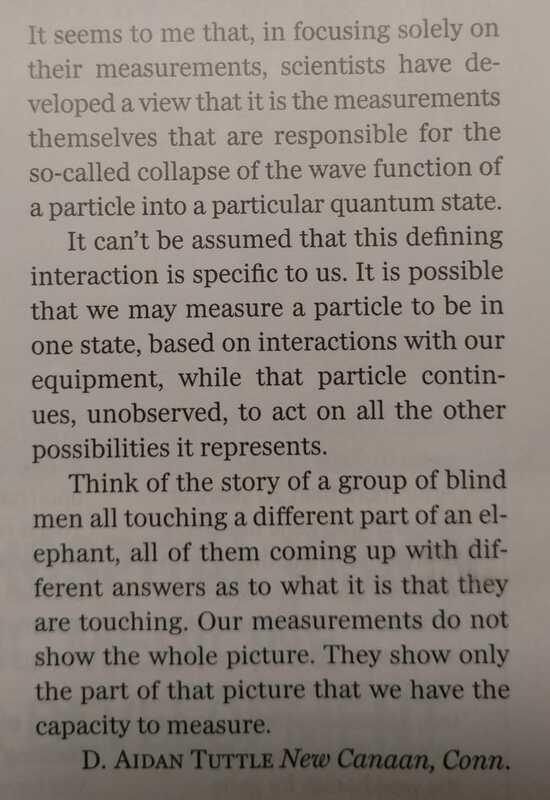 One way to respond to Tuttle and Hobson would be to point out to them the following : We do not have interpretations of QM because we are attempting to square QM with common sense. Nor do we have interpretations of QM because we seek to uncover a wholly classico-mechanical reality "lying underneath" the phenomena. We have these interpretations because the formalism does not contain wave function collapse, nor particle trajectories, nor randomness. We see all three under controlled conditions. Randomness, collapse, and trajectories are all observed. Something is missing -- hence interpretations. 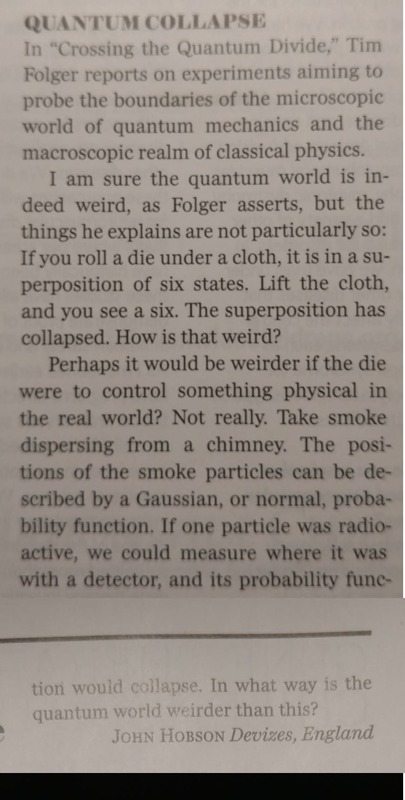 The Folger article mostly covers apparatuses which could falsify (or maybe verify) a cluster of objective collapse theories, including in particular CSL. In regards to this topic, however, I would summarize the article as making two key claims. Claim 1: Scientists do not understand why collapse appears to happen and give rise to a stable classical reality. 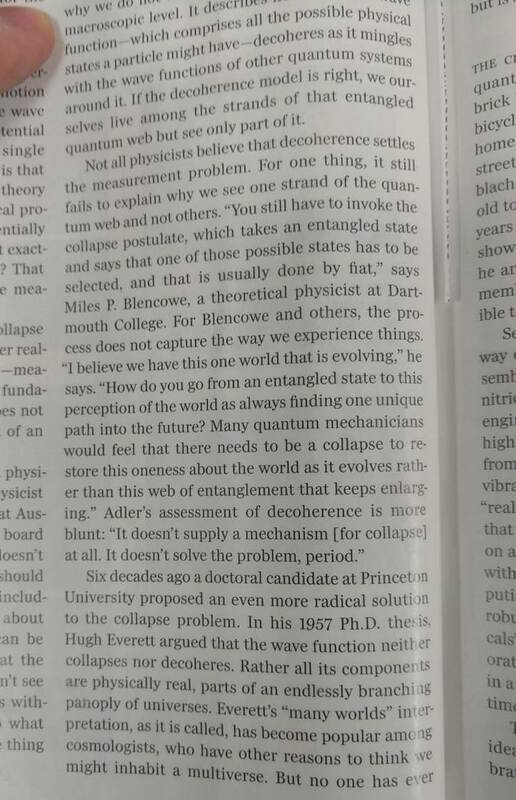 Claim 2: Not all physicists believe that Decoherence settles the Measurement Problem. To ease communication of the topic, we can adopt some verbiage. I like the phrase "collapse postulate". It neatly captures the status of collapse. This dovetails well with what Lubos Motl and Cassey Blood wrote about it. Read the article from a paper copy yesterday. I found it clear and well organized. I like the Dutch experiment with the tiny chip of silicon nitride and the plan to let those cute little tardigrades go for a ride. Admit I wasn't sure what sort of data they plan to obtain from the tardigrades. I found it clear and well organized. Folger tried to cover about 70 years of intellectual and scientific struggle in the space of like 7 pages. It was a Herculean task. I should probably back off a bit on my cynicism. He had to cover some deep subjects in one paragraph of synopsis. This is likely the reason that communication failed with some readers, and not due to Folger's efforts.